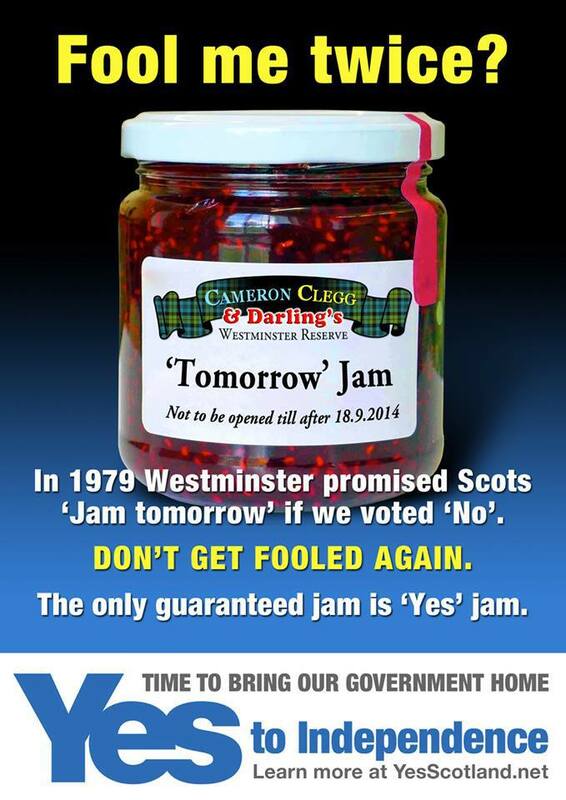 The unionists sometimes talk about the extra powers Scotland will get if we vote No. 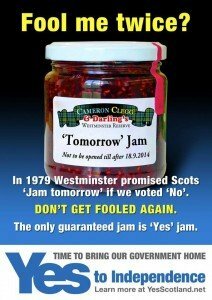 Apart from the fact that it will probably just be a case of jam tomorrow (given that there won’t be any political necessity to increase devolution), nobody has so far put forward a case for devolving any further policy areas to Scotland, just making Scotland responsible for raising more revenue. Social security: The strong reaction to the bedroom tax makes it clear that Scots would prefer to see the majority of the responsibilities of the Department of Work and Pensions devolved to Scotland. However, it’s one of the few remaining areas where Westminster still plays a massive role in the life of ordinary Scots so I doubt any UK government would be happy to transfer these powers. EU representation: It’s constantly a problem that Scotland doesn’t always get as good a deal in the EU as independent countries because Westminster ministers do the negotiating for us, even in fully devolved areas. However, even if Westminster agreed to this, the EU would probably veto it. Military and foreign affairs: The Scottish reaction to the Iraq war and to having the UK’s nuclear weapons stationed just outside Glasgow makes it clear that most people would prefer to devolve these areas to Scotland. However, this is one of the hallmarks of an independent country, so it really won’t happen without independence. Postal services: Given that Westminster are constantly talking about privatising the Royal Mail, it would probably be very popular to keep it state-owned in Scotland, but exactly because it’d be popular, there’s no way it will happen. Broadcasting: Many Scots are reasonably happy with the BBC, but at the same time it would be great to get more dedicated Scottish programming (such as the “Scottish Six”), which would be more likely if some broadcasting powers were devolved. However, Westminster would be worried at the prospect of the BBC turning into a pro-independence channel, so there’s no way they’d do this. Air transport: Scottish politicians often complain that Scotland needs a lower air passenger duty than England to keep the Highlands and islands inhabitable, but I have a feeling London-based politicians would fear that some international airlines would start flying to Scotland instead of London to take advantage of this, so again I doubt this would happen. Immigration: Whereas English politicians (who can feel UKIP breathing down their necks) are getting very wary of immigration, Scotland is a much more welcoming place, and we need some immigration to keep the country going. It would be very useful if immigration was devolved. However, Westminster would be worried that immigrants would enter through Scotland and then move down to London, so this is a non-starter. When you look at this list, two things strike me: Firstly there’s no chance in a lifetime that Westminster will actually consider devolving any of them, and secondly, most of them are attributes of an independent state. The powers we need in Scotland are not those of a region with devolved powers, but those of an independent state.